Nader Ghermezian and Stuart Bienenstock at Monday’s public hearing. 3D printed rocket engines, MagLev trains and composite helicopter blades are among the technologies pitched as potential tenants of an industrial park proposed by developers Triple Five Real Estate One, LLC for the Enterprise Park at Calverton at the former Grumman plant in Riverhead Town. During a nearly five-hour continuation of a qualified and eligible hearing held by the Riverhead Town Board at Pulaski Street School Monday night, representatives of a new Limited Liability Company known as Calverton Aviation & Technology (CAT) pitched their plan to buy 1,643 acres at EPCAL for $40 million and build at least one million square feet of commercial and industrial space at the site, and to spend no less than $1 million to improve the runways there. Luminati Aerospace, the original proposed buyer, has been drenched in controversy since it first announced plans to buy the majority of the land at EPCAL one year ago. Luminati partnered with Triple Five in late 2017, creating the new company, CAT. While Luminati has been represented by Triple Five as having a 25 percent ownership stake in CAT, Luminati CEO Daniel Preston did not appear at an earlier Qualified and Eligible hearing Feb. 27 or at Monday night’s hearing. 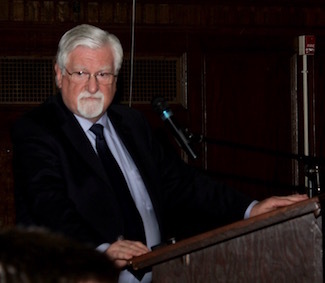 Stuart Bienenstock, the Director of Business Development for Triple Five Real Estate One, said that, since the Feb. 27 hearing, Mr. Preston had been stripped of his voting rights within the company. While Triple Five Chairman Nader Ghermezian presented a letter from Mr. Preston stating he was aware he wouldn’t be a voting member of the corporation, the developers have not yet presented the town with an operating agreement between Luminati and Triple Five, despite repeated requests for that document from the Riverhead Town Board. “We haven’t dismissed Daniel Preston as a partner. We’ve just taken away his voting rights so that made it more clear that we’re in control,” said Mr. Bienenstock. “We definitely are still in partnership with Daniel Preston, and we plan to continue to do that. “We heard you had a problem with him, but you didn’t have a problem with us, so we cut him out,” said Mr. Ghermezian. 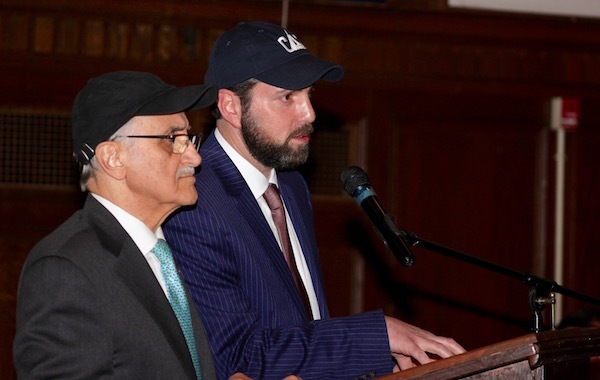 Mr. Bienenstock and Mr. Ghermezian brought numerous potential tenants of their industrial park to the podium to share the details of the work they’d like to pursue at EPCAL. Their presentations were met with a splattering of applause from the crowded auditorium, which included a hearty showing among members of the community and supporters of “Long Island Needs a Drag Strip,” who listened patiently to nearly three hours of presentations before asking pointed questions of the applicants. Max Haot, the founder of video streaming company Livestream, is developing a new company called Launcher, based in the Brooklyn Navy Yard, which is working to build rocket engines using a 3D printer. The rockets, which he’d like to assemble at EPCAL for delivery to NASA launch facilities in other parts of the country, would deliver 300 kilogram satellites to low-earth orbit. Mr. Haot said the company, which is just beginning its second year in operation, has just begun testing its engine at EPCAL, subleasing temporary space from Luminati Aerospace. Mr. Haot said his company has a ten-year plan to develop their launch vehicle, during which they will employ just 10 people, not all of whom will be based at EPCAL full-time. 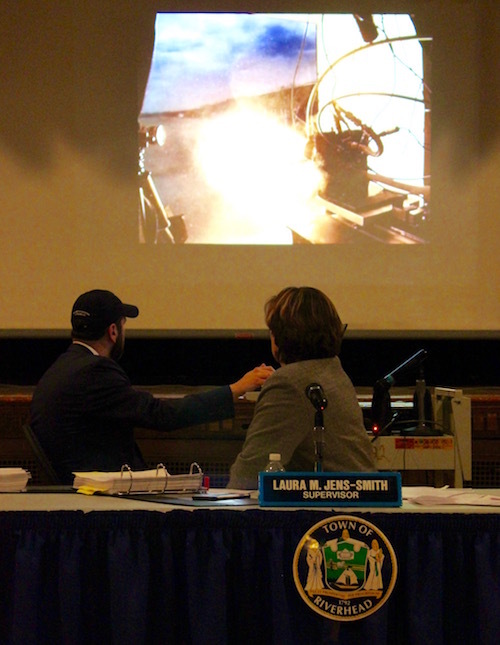 Town Supervisor Laura Jens-Smith watches a presentation on Launcher’s rocket engine technology. MagLev Strategies founder Jesse Powell said he would like to work at EPCAL to develop freight applications for MagLev technology. Mr. Powell’s father, James Powell, was half of the Brookhaven National Laboratory team that invented MagLev, which uses the power of strong magnets to propel trains at high speed without the friction associated with traditional rail transport. Jesse Powell told the town board that he believes MagLev rail could revolutionize long haul transport in the United States, delivering freight from Los Angeles to New York in eight hours. He said, using this technology, rail freight companies could charge half as much as long haul trucking companies and still make a profit. He added that MagLev vehicle construction is very similar to the construction of airplane fuselages, and could be aided by composite material companies also looking to work at EPCAL. The catch, though, is providing the rail network to make such a plan a reality. Jesse Powell discussed MagLev technology. Town Supervisor Laura Jens-Smith said she’s seen that MagLev projects in the United States in the past have suffered from a lack of funding. Mr. Powell said he believes the key to success is a public-private partnership. Max Gross, the Director of Engineering Technology Development at the Composite Prototyping Center (CPC) in Plainview, shared work he’s doing, much of which involved Department of Defense contracts, for composite flooring for Navy helicopters, composite heat pump housing, and carbon epoxy rotor blades for counter-rotating helicopter rotors. He estimated the company could use about 35,000 square feet of space at EPCAL. Ms. Jens-Smith said she’d heard CPC had been looking to expand in Upstate New York, not on Long Island. Town board members asked numerous pointed questions of the developers, on topics ranging from the deed covenant prohibiting commercial use of the runways at EPCAL, as well as Luminati’s existing runway use agreement with the town, to financial concerns ranging from whether Triple Five plans to pursue tax breaks to whether they intend to sell any of the property after they purchase it. Ms. Jens-Smith said that, when projects like this are successful, it’s usually because there’s one large tenant to support the startups. Triple Five consultant ​Steven R. Rodgers of EmergenTek LLC, and an expert in best practices in commercialization and manufacturing of advanced materials, had laid out a lengthy presentation on why now is the right time for aerospace at EPCAL, beginning with a story about how the Black Plague lead to more wealth for people who survived the plague, who began wearing linen underwear, which was recycled to paper, which was widely available when Gutenburg invented the printing press, which led to the widespread dissemination of ideas that led to the Renaissance. “We’ve been working on this for a month now. We’re working with big companies, but it’s going to take a matter of digging in big-time once we get the green light for projects,” said Mr. Rodgers. “Luminati has tried for a year and not been successful,” said Ms. Jens-Smith. “There’s a big difference between the resources of Luminati and the resources of Triple Five,” said Mr. Rogers. Triple Five World Wide, the parent company of Triple Five Real Estate, is the developer of the Mall of America in Minnesota and the West Edmonton Mall in Alberta, Canada, and also has companies involved in everything from manufacturing of garbage trucks to industrial manufacturing and biotechnology. He added that his company has an A-rating with corporate finance institutions and will have no trouble financing the project. Councilwoman Jodi Giglio asked repeatedly for clarification on what will happen with Luminati Aerospace’s runway control agreement with the town, and asked the applicants if they understood that the runways could not be used for commercial aviation activities, including uses such as a FedEx depot or a site for landings of chartered planes and helicopters. “We are not going to build a shopping center or housing” at EPCAL, said Mr. Ghermezian. Mr. Bienenstock said he believes Luminati’s runway control agreement can be cancelled if the land is sold to CAT. Several community members also asked pointed questions, while a few more expressed support for the project. “Luminati is the entity that has control of the runway to 2025, with two unilateral options to extend to 2045. There is no doubt they are in control,” he said. Mr. DeLuca added that his son is studying engineering at SUNY Binghamton, and he doubts he will return to Long Island without engineering jobs here. Bob Kern of the Riverhead Chamber of Commerce was on the town committee that had examined a prior proposal to build an indoor ski mountain at EPCAL. Riverhead Town Board members listened to the proposals. “We’ve got some rock stars here tonight,” said Mr. Kern, then asked a man with an iPad set up on a tripod near the podium: “Are you livestreaming? That guy invented it,” pointing to Mr. Haot. Phil Barbeto of Aquebogue asked why CAT needs to subdivide the property if they are developing the whole thing, and questioned whether they plan to sell some of the lots. He added that, with increased development would come increased demand for services, road improvements, and staff in the school and at town hall. “If anyone still believes, in this day and age, that more development means less taxes, you’re in the wrong place,” he said. Mr. Bienenstock said the subdivision plan is required as a condition of closing on the property. “We have no plans to sell off the lots separately,” he said. 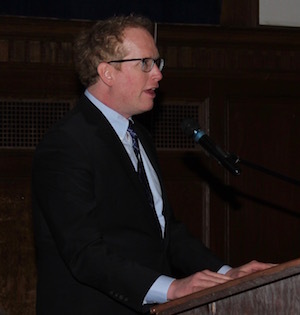 Riverhead resident Matthew Stadler runs Stony Brook University Small Business Development Center’s technology entrepreneurship program. He said the university has four separate incubator facilities, and works with 70 tech companies. “It’s not enough. I’m proud of what the university has accomplished, but it is one component of the ecosystem, not the whole ecosystem,” he said, adding that, while the university has an incubator at Calverton, it’s currently difficult to get entrepreneurs interested in coming out east to work here. The board held the public hearing open for written comment to April 6 at 5 p.m. Documents submitted by CAT as part of the Qualified & Eligible process are online here. High-Flying Solar Drones at EPCAL? And Why Not? How can the Town Board accept that this is the same legal entity with which the previous board rushed to sign an agreement? How can the town be dealing with the Ghermezians based on a letter of intent with a “silenced” partner? Presumably they keep Luminati in play only for the special advantage it affords them on cost and land coverage, a flag of convenience or deception. Is that legally tenable or could any deal be challenged in court? Their refusal to compete openly and transparently, despite their substantial investment in conceptualization and promotion, says everything.